Can labor unions reverse their decline? Labor unions have played a central role in recent national fights to raise the minimum wage, reduce income disparity and make work hours and rules more worker friendly. In addition, unions have sought to expand their message and membership ranks to nonunion groups and some white-collar sectors, such as adjunct college faculty and lawyers, and to offer union leadership positions to black women, one of their most loyal constituencies. 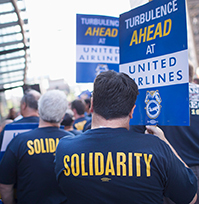 The recent surge in union activity has prompted some observers to speculate that organized labor may be ripe for a revival. However, some academic experts and labor activists say the odds are stacked against that. They point to continued declines in union membership and unyielding opposition from many businesses and the Republican Party, as well as structural shifts in the workplace toward foreign outsourcing and temporary employees. Even some traditionally pro-union Democratic politicians have split with unions over the Trans-Pacific Partnership, a global trade treaty backed by President Obama that labor officials argue would lead to lost jobs and lower wages.